Were the MDPI Co-Conspirators Coerced or Conned to Remove the Crucial Peer-Reviewed Paper? It was only a matter of time before the “system” would unjustifiably remove the single most import scientific research paper from the library of its peer-reviewed journal. 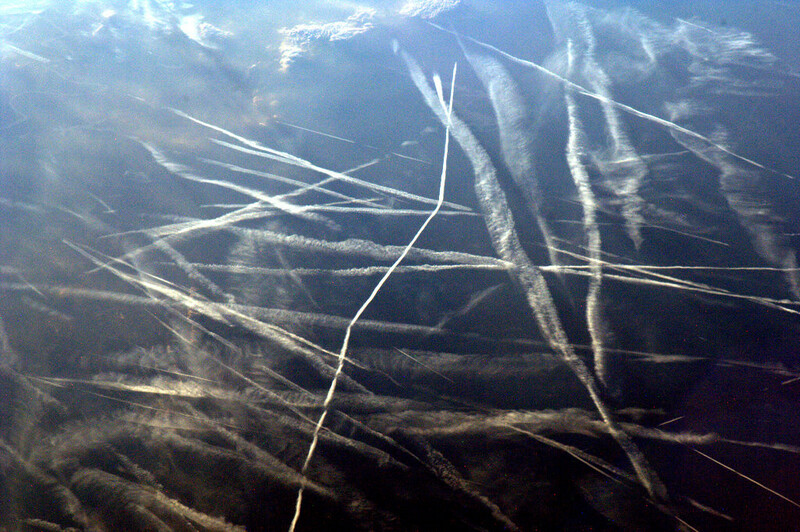 The concerned paper proved the methodical utilization of coal fly ash in the chemtrails which routinely criss-cross the skies across America. Dr. Marvin Herndon wrote a definitive paper on the use of coal fly ash in chemical geoengineering programs which are being covertly implemented nationwide (as well as worldwide). Because of the immense and highly destructive environmental health repercussions of these chemtrail aerosols, Dr. Herndon’s scientific research posed a grave threat to a global geoengineering regime. That nonstop spraying regime has been intensified considerably over the past three years, and further ramped up since January of 2015. The geoengineers, and those who oversee them, clearly could not endure the fact that a top-tier scientist exposed that these extremely toxic chemtrail formulations contains coal fly ash … in great measure. In other words the very same coal fly ash that is mandatorily removed by coal-fired power plants, as per EPA rules and regulations, is then used as the primary ingredient in the ubiquitous chemtrail and chembomb aerosols. By way of Operation Indigo Skyfold, chemtrails containing extremely toxic coal fly ash are now systematically sprayed in the skies across the USA and beyond. 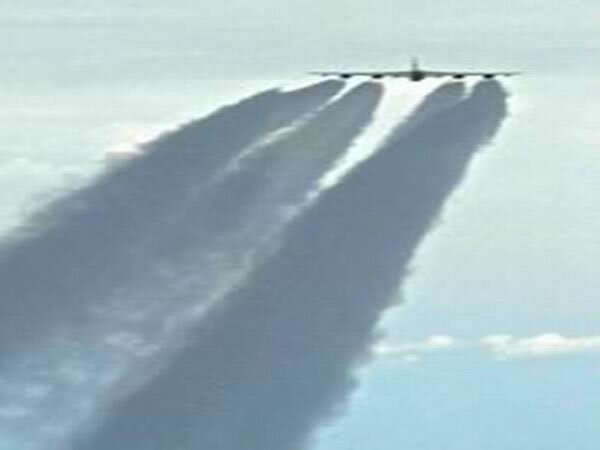 The ramifications of this massive and clandestine chemical geoengineering program are so staggering that those who have unlawfully administered it know that the Herndon paper poses the greatest threat to its existence. 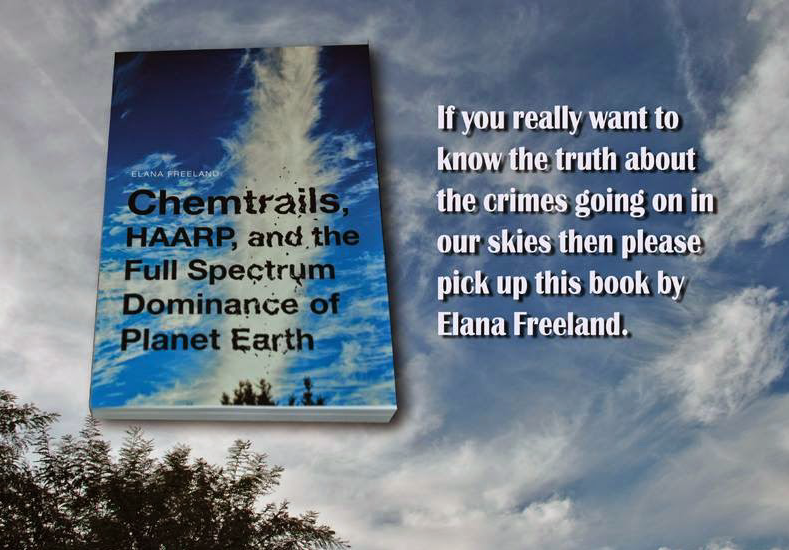 In fact, Dr. Herndon’s paper indirectly demonstrates these ongoing chemtrail operations could be construed as a crime against humanity, so destructive are they to human health and environmental integrity. This exceedingly harmful type of geoengineering — chemical geoengineering — also represents a profound assault against the biosphere. All animal and plant life on the planet are adversely affected by the continuation of this dangerous pollution-generating scheme. Because the airborne (as in troposphere and stratosphere) chemical aerosols eventually descend to the surface of the Earth, all the land masses, water bodies and biota are contaminated to varying degrees by their toxic chemical and biological constituents. In light of these and many other far-reaching effects of toxic coal fly ash being deliberately sprayed on human populations the world over, Dr. Herndon’s work was destined to be discredited by the decision-makers at the very top of the geoenineering hierarchy. After all, his excellent scientific sleuthing has proved them to be guilty of chemical assault and chemical trespass on a vast and unprecedented scale. The key contribution of Dr. Herndon to the world community of nations is revealing that coal fly ash is the main component of chemtrail aerosols. In so doing he has provided all adversely affected populations on the planet the legitimate scientific basis for remedial legal action. A class action lawsuit is already in the works which will be bolstered by these scientific findings. Many other lawsuits are also being contemplated by both individuals and organizations alike. Because of the numerous medical ailments and health conditions directly associated with chemical geoengineering programs, the compensatory and punitive damages will surely run into the trillions of dollars. Countless communities and businesses have likewise been the victim of chemical trespass which will only hyper-inflate the damages awarded. However, it is the prospect of criminal indictments which certainly caused the chemtrail perpetrators to take such exceptionally aggressive action against Dr. Herndon. By improperly removing Dr. Herndon’s ground-breaking paper from the peer-reviewed International Journal of Environmental Research and Public Health (IJERPH) the perps had hoped to undermine its damning conclusions. More importantly, they have attempted to render it impotent in the context of filing lawsuits and criminal charges against those controlling authorities who are responsible for what amounts to a multi-decade aerial crime wave perpetrated against both people and planet. The newest development in this criminal investigation is the transparent conspiracy within the MDPI leadership which was used to wrongly retract the paper. The principal parties involved with this travesty are IJERPH Editor Dr. Paul B. Tchunwou, MDPI Chief Science Officer Dr. Franck Vazquez, and MDPI Principal Dr. Shu-Kun Lin. Each of these co-conspirators has participated in a plot to deprive the American people, as well as the world-at-large, from essential evidence proving the existence of serial criminal activity occurring right overhead. Therein lies the true reason for such an audacious move on the part of the ill-advised management at MDPI and IJERPH. 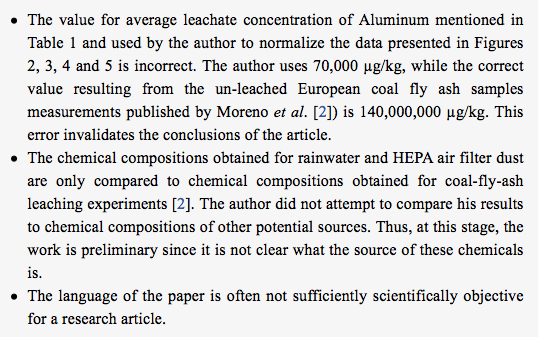 It is not very often that a scientific research paper written by a world-class scientist is falsely retracted by a journal of such stature. In fact, it is quite unusual. However, in the instant case, the following paper exposes an ongoing crime of truly epic proportions. The irrefutable evidence contained in the paper could therefore be used in virtually any court of law. Hence, the continuing chemtrailing, particularly in view of the paper’s scientific evidence, produces extraordinary legal exposure and financial liability for all parties who have colluded in this unparalleled global crime spree. By making such a bold move in an attempt to dismiss Dr. Herndon’s critical revelations, the IJERPH co-conspirators have only given this urgent story more traction. In their zeal to disparage indisputable evidence of ongoing crimes against humanity they have joined the side of the criminals. One would think that an international journal dedicated to “Environmental Research and Public Health” would have the good sense to support such vital scientific research. After all, Dr. Herndon’s paper has disclosed some of the most significant facts of what may be the greatest public health disaster in human history. 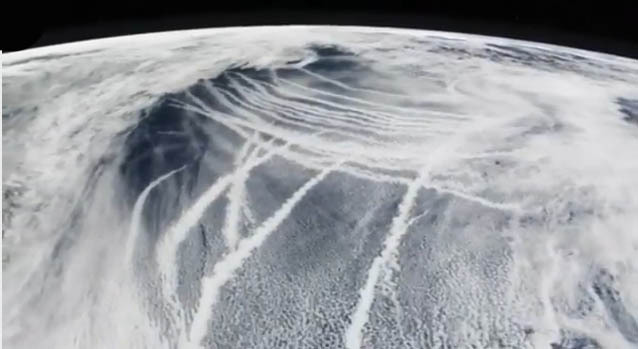 The pervasive devastation directly caused by chemical geoengineering is certainly evolving into the worst environmental catastrophe the planetary civilization has ever experienced … and it’s entirely manmade. 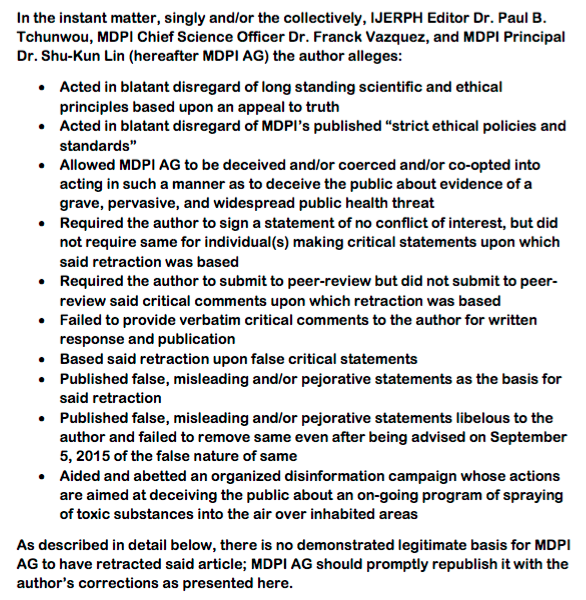 The following screenshot was taken from the MDPI website page where the official IJERPH “Retraction” has been posted. It is clear that, while there was a small calculation error which has since been corrected by Dr. Herndon, the three reasons for rejecting the paper outright and without recourse are both flimsy and baseless. Rarely does an open access international journal of such standing in the scientific community act so irresponsible and recklessly. It’s as though they are being directed to retract the paper by their CIA handlers, as Dr. Herndon perceptibly alludes to in his “Public Notice of the Author’s Rejection“. For those who are initiated in this realm of scientific sabotage, it happens not just routinely; rather, such treatment has becomes the normal experience for those scientists who engage the most politically incorrect matters. In other words if the ruling elites want chemical geoengineering to continue unimpeded, it surely will. The global power structure will not let unimpeachable science regarding chemical geoengineering, or hard evidence of environmental destruction, or proof of personal injury, or anything else get in the way of the advancement of their biosphere-altering agenda. Clearly, it doesn’t get any more serious that this. When a drama plays out which has effectively indicted an untold number of government agencies, military operations, major universities, scientific research institutions, contracting MIC* corporations and other related organizations, something very serious indeed is going on. And yet the geoengineers continue to act with such impunity, as the skies everywhere clearly demonstrate. Dr. Marvin Herndon has taken a lead position in exposing the highly misguided chemical geoengineering enterprise. He has put his personal resources and scientific reputation on the line in a way that no one else has. The good scientist has also taken the extraordinary initiative of stepping into the shoes of a citizen activist. The following link provides a quite telling video featuring Dr. Marvin Herndon’s personal plea to humanity. He articulates exactly what is at stake for humankind, and just how consequential chemical geoengineering can be. 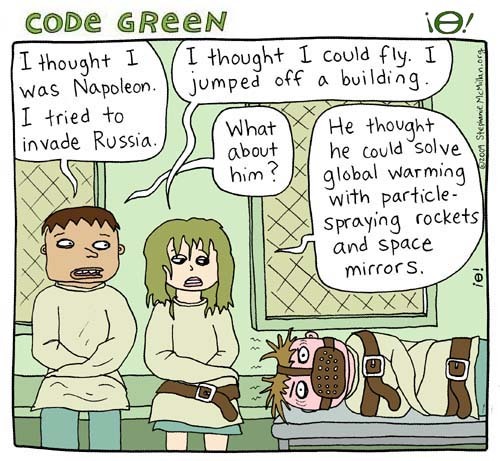 Truly, if the people of planet Earth do not coalesce around this dire matter known as global chemical geoegineering, they will inevitably forfeit their access to a biosphere that provides viability to the human race. Yes, it’s that serious. Not only does the future of the entire planetary civilization hang in the balance, the fate of the planet is in now in serious question. After all, both are currently being determined by a few geoengineers who work for a corrupt cabal of incorrigible crazymakers.